This summer in Washington State has been truly lovely. Lots of blue skies and sunshine, but still with fairly mild temperatures. This is the weather for me! But, the sweet is never as sweet without the sour. It is hot hot hot today. The dragonflies are humming, the kids are in the sprinklers, and BBQs are fired up all over the neighborhood. It's the kind of day made for frozen treats. I found a recipe, credited to The Nashville Cookbook, on Ezra Poundcake. 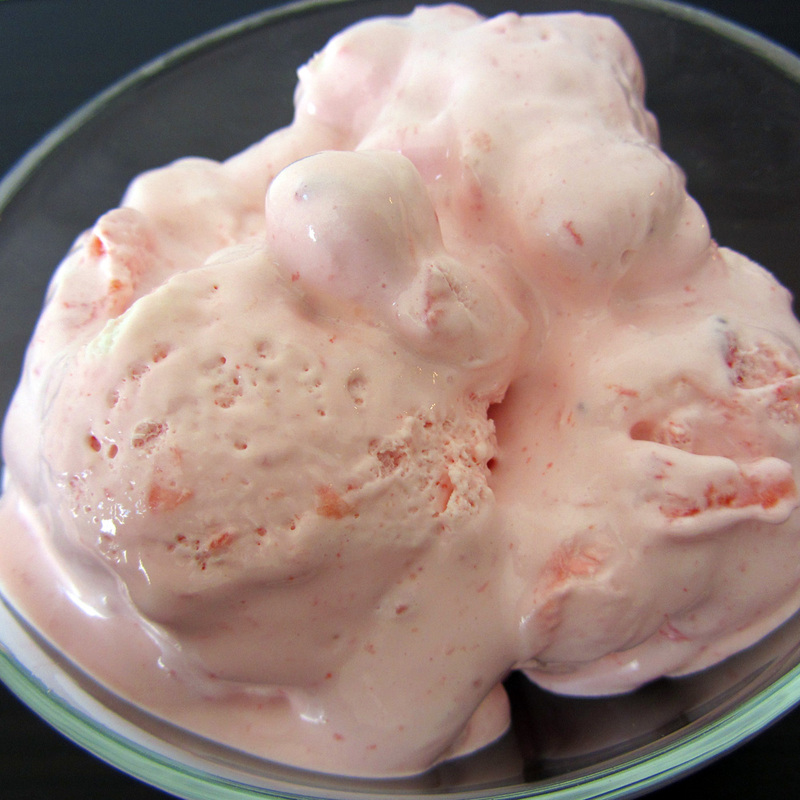 Pink Velvet Salad - A Cool Whip salad with a twist. It's frozen. When I first read this, I thought it might freeze hard. I thought it might be overrun with ice crystals. Not so! The sweetened condensed milk, along with the Whip, keep this soft and creamy. It is a fast and easy recipe that requires only a few ingredients: Cool Whip, Pineapple, Pie Filling, Sweetened Condensed Milk, and Mini Marshmallows. It is my husband's humble opinion that the marshmallows should be omitted (conflicting texture and too sweet, he says). I personally love marshmallows and think them right at home here, but let no one's voice go unheard! I really wanted to follow the original recipe, but the ingredients available at the stores just didn't come in the right sizes. The recipe below shows the measurements I used. Also, the recipe calls for cherry pie filling. Because one of the people I'd be serving this to is allergic to cherries, I substituted with strawberry pie filling (and saw online that people also make it with blueberry). The result was quite pleasing. It may not be a fancy gourmet ice cream, but it's good! 1. Mix the pie filling, pineapple, and sc milk together in a large bowl. 2. Gently stir the Cool Whip into the fruit mixture. 3. Gently stir the marshmallows into the mixture.